Today I wanted to write about something that unfortunately not many people are aware of, and I thought by writing this blog post that it would help to raise awareness on the matter. I was shocked to learn just how many different types and forms of scoliosis they are, considering I have the condition myself. I really wanted to make this blog post to let people know and make them aware of the different types and there names. - I'm going to start with Adolescent Idiopathic Scoliosis, this is probably the most common and well know form of scoliosis. Adolescent Idiopathic Scoliosis is a change in the shape of the spine whilst a child is growing or going through puberty. - Congenital Scoliosis, is when a child is born with the condition due to the spine failing to fully develop within the womb during pregnancy. - Early On Set Scoliosis, is when the curvature within the spine appears between birth and up to the age of 10, or before puberty. - Neuromuscular Scoliosis, is when the condition and curvature of the spine is caused because of a neurological or muscular condition. 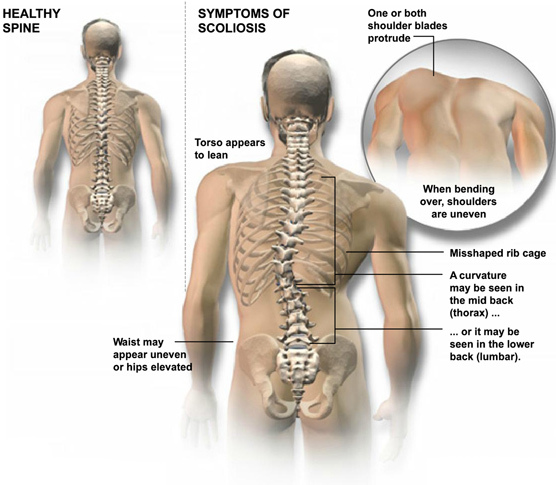 - Degenerative Scoliosis, is when the condition appears in an adult as the bones become weaker. - Syndromic Scoliosis, is a sideways curvature of the spine which develops as part of a syndrome made up of lots of symptoms. - Finally the last form of scoliosis, is Scheuermanns Kyphosis. Scheuermanns Kyphosis is a condition in which the front sections of the vertebrate ( small bones which make up the spine) grow more slowly than the back sections during childhood, causing the spine to curve under pressure. Thank you for reading, I really hope that you learnt something from this post, and please feel free to comment below if you have any one of these types of scoliosis and I will reply as soon as possible.